TLC's 4th Annual Kentucky Derby Party will be held Saturday, May 5th, 2018 at the Shupe Homestead in Longmont. After three wonderful years of hosting the Derby at the beautiful Schlagel Farm (infinite thanks to Vicki and Paul Schlagel for opening their home to us! ), we are excited to grow into Shupe Homestead's gorgeous venue. The Shupe Homestead is settled on green meadows with views of the Front Range, and offers an indoor dancing and dining hall set along gardens and ponds. All proceeds of the derby - from tickets to sponsorships and everything in between - goes directly to TLC programming and scholarships for kids with special needs or from economically disadvantaged backgrounds. We have almost 30 generous event sponsors, and room for more if your business or family would like to sponsor. Download a sponsor application here. Tickets are $150 each and the event is limited to 200 guests, so don't be ticket buyer #201 and get left out in the cold. $50 of each ticket purchase is tax-deductible*, and all money benefits TLC children. *Please note the original email said $100 was tax-deductible. This is backwards. $100 is our cost and is NOT deductible. $50 of each ticket IS tax-deductible. Thank you! Two views of Shupe Homestead. 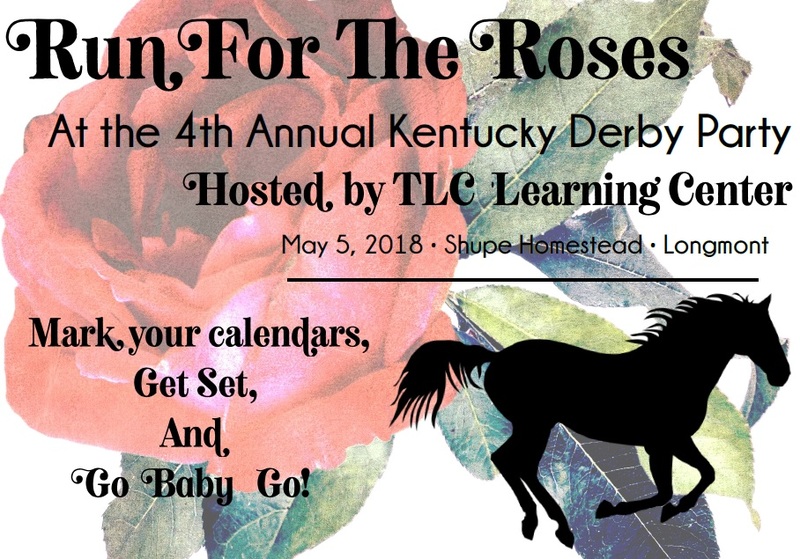 TLC will take over Shupe Homestead on May 5th with mint juleps, bourbon, televised races, horse betting, live auctions, cigars, and good times for our Kentucky Derby Party in support of our programming. The next Parent Toolkit Night is April 26th from 4:30-5:30. 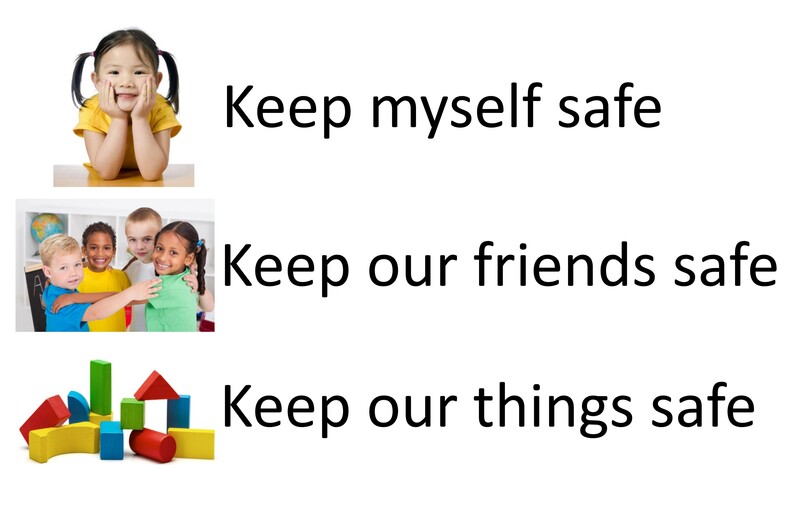 We will be talking about emotional literacy and how this directly ties into decreasing challenging behavior with your children (and maybe partner!). As usual, there will be a sign up if you want your child to stay in the afterschool program while you attend and there will be a giveaway. Keep reading Renee and Russell's report over at the TLC blog. TLC's Own Clara Shipp is the 2018 Happy Smackah! This year’s Happy Smackah 5k Fun Run supports our own Clara Shipp! Please come out and support Clara and this event. You can walk, run, skip… whatever gets you to the finish line! Read the Longmont Times Call's profile of Clara and the Happy Smackah race here. 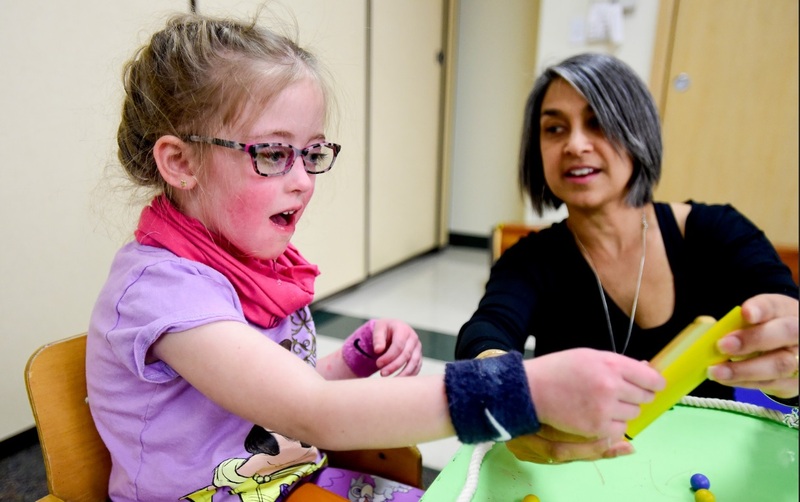 Clara works with TLC Therapeutic Services Manager and Occupational Therapist Shari Karmen during a therapy session at TLC. Please join us for a Volunteer Appreciation Breakfast on Tuesday, April 17th, from 7:45 - 9:30 AM. 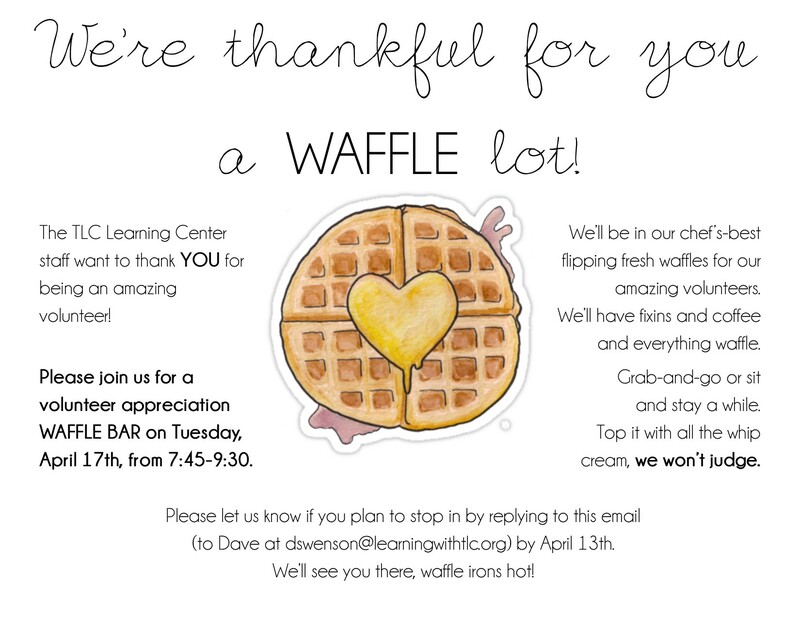 TLC's Executive Director Matt (and a few staff helpers) will be flipping fresh waffles on hot waffle irons for volunteers. Load your waffle up with whatever you like from our topping-full waffle bar, and stay and eat or take and run. We are so appreciative of the work our volunteers do to keep TLC running, funded, and a beacon for children and families in the community. Please plan to drop in so we can thank YOU for all you do!